The No. 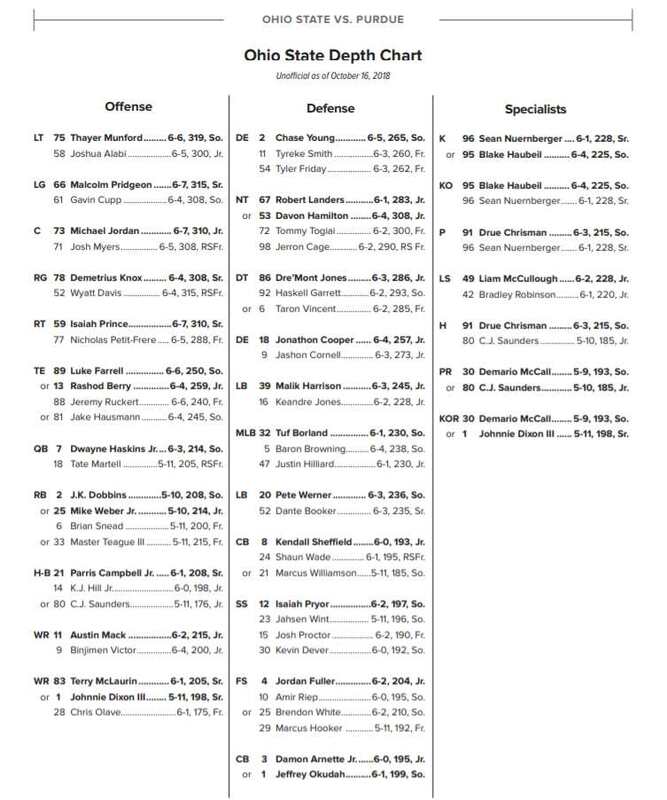 6 player on this list is an undersized nose tackle, but he uses his dimensions to his advantage. He has been the backup the last two seasons, but now is his time to shine. At one time, Robert Landers was committed to West Virginia, and it isn’t difficult to imagine what he would have done early and often in the Big XII. Instead, the Dayton native received a late offer from Ohio State and decided to be a Buckeye. After redshirting as a true freshman in 2015, Landers emerged as the backup nose tackle in 2016, and that’s where he was last year as well. In his first significant playing time as a redshirt freshman, he had seven tackles for loss in the Buckeyes’ first five games. Unfortunately, he only had one other TFL the rest of the season. 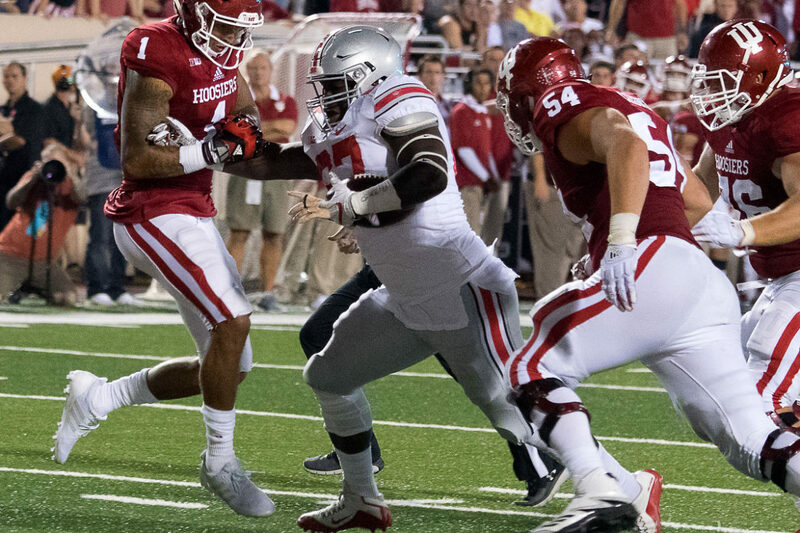 Last season, Landers managed five tackles for loss in a limited role due to Ohio State’s Rushmen package and the constant rotation of defensive linemen. When he is in the game, however, he is a leverage and quickness problem for any interior offensive lineman. Generously listed at 6-foot-1 and 283 pounds, Landers does not look like your typical nose tackle. He uses his ability and stature to stay low, which allows him to get up under blockers and penetrate. As they say, the low man wins, and it’s hard to get lower than Robert Landers. Landers is also a tremendously quick defensive tackle. Guards and centers have difficulty with his first step, and if he is timing the snap properly, they are going to watch him run right by quite a few times per game. A relentless pursuer, Landers may not be able to stretch out an end around or make a play on a wide screen, but he is still going to try. Most of the time, however, he is simply going to go straight ahead, and do it with rare quickness and burst. Landers is the Buckeyes’ starting nose tackle this season, which means he will get at least half the snaps on most running downs. He will come off the field on passing downs, which is always going to limit his sack numbers — he has just one in his career. As a nose tackle, most of Landers’ big plays are more about causing a major disruption than simply bringing a ball carrier or quarterback down. Yes, he can do that, but he has other jobs as well. Landers will be a leader for the Buckeyes this season, and his relentless effort will be a great example for everyone else to follow. It will also lead to quite a few plays being made in the backfield.